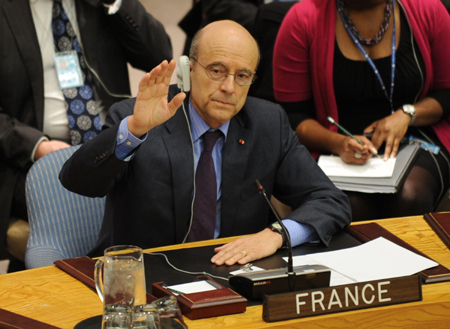 UNITED NATIONS, September 28 -- French foreign minister Alain Juppe said "no" on September 19 when asked "Were diplomacy and sanctions to fail in the case of Iran, would France favor military intervention?" Juppe replied, "Very simple answer: No. We intervened militarily in Libya, but I would like to reassure you, we are not fans of military intervention, of course, especially against a country like Iran... I think that sanction are efficient on the long term." Eight days later French Permanent Representative to the UN Gerard Araud was dutifully quoted by French government media Agence FRANCE Presse that "If we don't succeed today to reach a negotiation with the Iranians, there is a strong risk of military action." So which one is true? AFP did not mention Juppe's previous statement, only intervening statements of Nicolas Sarkozy. AFP called these Araud's "surprisingly frank comments at a New York panel discussion" -- but it involved only Araud and a single questioner. Nor did AFP analyze another Araud quote it transcribed, that "'All the Arab countries are extremely worried about what is happening' with Iran's nuclear drive." One question is obvious: isn't Syria an Arab country? Lebanese Permanent Representative to the UN Nawaf Salam was holding a reception Tuesday night less than 20 blocks from Araud's "panel discussion" to which UN press corps members were only selectively invited. AFP reported the most breathlessly about Araud's remarks, without analyzing or weighing any of them. On Wednesday at the UN's noon briefing, AFP reporter Tim Witcher came and asked the spokesman for Secretary General Ban Ki-moon if he wished to say more about Syria than was in the short read-out of Ban's meeting with that country's foreign minister. Not surprisingly, and seemingly scripted, the spokesman did have more to say. This same reporter on Tuesday after Sudan's foreign minister Ali Karti said that of the UNISFA peacekeepers "fifty percent are there" in the contested Abyei area asked Karti, "fifty percent have left?" Karti said "no, deployed." Anyway, France is sure to have its own numbers. Watch this site.